I'm curious what APC is doing...the wells they are drilling are Haynesville wells, not Cotton Valley right? 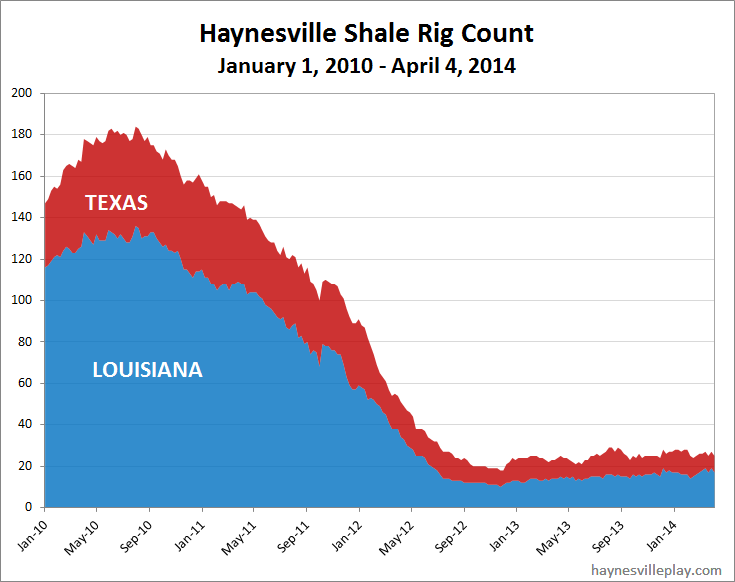 I wonder if they have downstream pipe commitments to fulfill which is driving their rig presence in Haynesville? But considering the last wells they drilled where 4 years ago, unless they have a working interest in other wells in the area, that might not be the driver. Just going through the math on that slide, they said they produced 48 MBOE/d or 48 MBOE/d x 6 MMCFE/MBOE = 288 MMcf/d in 2013 And they want to increase it to 52 MBOE/d x 6 MMCFE/MBOE = 312 MMcf/d in 2014. Not sure what their type curves look like and what kind of decline they are battling to keep daily rates stabilized though, but it makes me wonder if they will move more rigs in and what kind (if any) of mid/downstream commitments they might have or would be willing to consider. I guess the real reason I'm curious is they haven't completed wells here since 2010. Maybe they have certain legal/lease requirements also keeping them in town? Appreciate the info as always Richard. Keep it up! Joel: If you are talking about their activities in Louisiana, yes they are Haynesville wells. 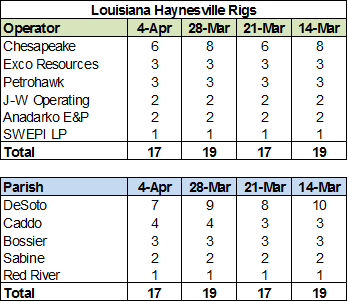 They have completed three in Caddo Pine Island (http://haynesvilleplay.com/haynesville-la-completions-operator.pdf - page 1). Their 2010 completions were actually operated and completed by J-W Operating. Most of their ETX wells, at least over the past year, do produce some amounts of liquid at the well head and I understand they strip out more down the line. In a baseball analogy, I think it turns a single into a double, but it's definitely not a home run. In terms of motivation, I don't know. 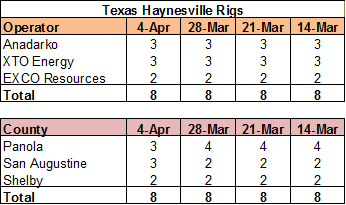 What I can tell you is that their presence in the Haynesville area in terms of rig count has actually declined by more than half over the last several months. But - and I haven't done the research to support this - I have noticed that they have drilled a lot of wells but I don't see that their pace of completions is anywhere near the pace of drilling. Perhaps they are building an inventory with the intention of timing the natural gas market prices. Is there anyway you could update the google maps on the rigs? I just updated the rig maps. You busted me - I've been lazy about it.